Message from the Dean College of Business Administration Dean Laura Milner shares ways the CBA is investing in its people. The College of Business Administration is professionally accredited by AACSB - International, The Association to Advance Collegiate Schools of Business. The University of Wisconsin-La Crosse is an affirmative action/equal opportunity employer and is in compliance with Title IX and Section 504. 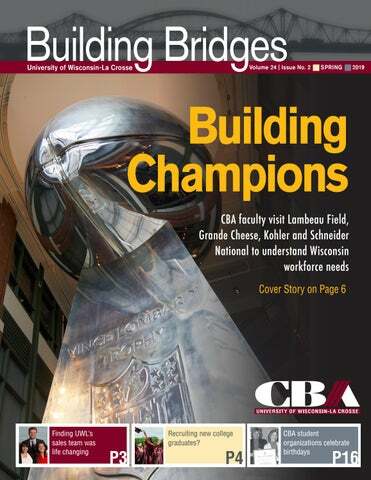 COVER IMAGE: During a tour of four Wisconsin businesses, CBA faculty met alumni employees of the Green Bay Packers and toured Lambeau Field. This is a 50-foot-tall chrome replica of the Vince Lombardi Trophy they saw on the tour. competing in regional and national sales competitions after joining the team. Most also share how learning more about sales changed their life. As of this fall, more than 100 students have had the opportunity to attend local, regional and national sales competitions through participation in UWL’s sales team. Anecdotal evidence indicates students who participate in the UWL Sales Competition have more interviews and opportunities, and earn a larger entry-level salary than those who do not. UWL’s sixth annual UWL sales competition was Friday, March 8, an event made possible through partnerships with local business professionals who serve as judges. The top students from the UWL competition are part of a team that is eligible to go on to compete at a University of Minnesota competition in April and then the Great Northwoods Sales Warm-Up at UW-Eau Claire in fall 2019 where university students interested in sales from throughout the country compete. At this competition, top students conduct two sales presentations where they attempt to sell something to business professionals — national sponsors — who act as buyers. Epiphanie Belanger, a senior double majoring in marketing and psychology, has a job lined up with Adobe after graduation. Joining UWL’s Sales Team was one of the best decisions she made for herself professionally, she says. TOP PHOTO: UWL student Max Biebel at the Great Northwoods Sales Warm-Up. Photo courtesy of UW-Eau Claire Photography. HOW LONG EXPECT TO STAY Three+ companies in 5 yrs. published in “Wisconsin Business Voice” in April 2016. Two companies in 5 yrs. One company in 5 yrs. young business professionals. Researchers sampled nearly 950 business students across 11 of the 13 four-year UW System schools. Co-authors included: Mary Jae Kleckner, UW-Stevens Point; Peter Knight, UW-Parkside and Bryan Lilly, UW-Oshkosh. Factors important when considering a job* Percentage of millennials who rated this factor a 4 or a 5 on a scale of 1(low) to 5 (high). Factors that increased likelihood to apply Percentage of millennials who rated this factor a 4 or a 5 on a scale of 1 (least influential) to 5 (most influential). CBA faculty visit Lambeau Field, Grande Cheese, Kohler and Schnieder National to understand W Many CBA students tell UWL Associate Professor Adam Hoffer they are interested in working for the Green Bay Packers. Justin Gephart, ’04, director of sales for The American Club Resort, Kohler, says studying abroad his senior year in Scotland helped prepare him with his first job where he was required to travel. nies exposure and it creates an additional opportunity for guest speakers.” William Maas, associate professor of accountancy, plans to use examples from Kohler and Schneider National in his managerial accounting class to help students better understand costs companies pay to do business. Kohler, a manufacturing company, can be used to dig into the considerations of cost during the manufacturing process. Schneider offers services including trucking, brokerage, cross-border freight and logistics, which makes it a good example of costing different services, he adds. CBA field trip members at Green Bay Packers’ Lambeau Field. Wisconsin workforce needs “Providing first-hand company examples rather than using imaginary ‘widgets’ makes the topics more interesting and the costing more relevant and understandable,” explains Maas. Employer advice: gain relevant experience Many alumni working with the four employers highlighted the value of career-like experiences in college through internships, volunteer work, study abroad, semester-long research projects or part-time jobs. She also studied abroad and joined multiple clubs at UWL. “There was enough to choose from at UWL, and the things I did helped me to land my first job,” she says. “I didn’t realize I was building a resume at the time.” Gutekunst got his first internship scouting for the Packers in summer 1997 from a word-of-mouth recommendation from then UWL head football coach Roger Harring. Gutekunst had built a relationship with Harring as his assistant coach after injuring his shoulder as a football player. Krissy Zegers, ’02, Packers Hall of Fame and Stadium Tour manager, is involved in hiring many college students. She says getting relevant experience is key for students seeking employment with the Packers. “If you want to do finance for Green Bay Packers, think about what background you are bringing to the organization,” she advises. “For a lot of our internships here, we have students who have had sometimes three or four internships before coming.” Joy Langreder, ’93, human resource director for Schneider National, a transportation and logistics services company based in Green Bay, says the opportunity to become a human resources intern for the City of La Crosse initiated her more than 20-year HR career. UWL faculty and staff asked Alumnus Brian Gutekunst, general manager of the Packers, as well as other Packers staff, what they look for when hiring. Life lessons, good investments and giving back Alumnus Marc Gall, Rada Award recipient, shares insights Marc Gall, ’03, received the Rada Distinguished Alumnus Award in September 2018, one of the top awards bestowed by the UWL Alumni Association. The Rada award recognizes alumni who have graduated within the last 20 years, achieved professional distinction and taken part in humanitarian activities. Gall, vice president of BOK Financial in Milwaukee, started giving financially to UWL very early in his career, creating and funding two scholarship endowments. “So many people wait until they think they have everything they want out of life to give,” says Gall. “I felt it was important to give early in my career. I think I live pretty simply, and I had the things I felt that I needed.” Today Gall regularly participates in reviewing the applications for the scholarships he created and receives letters from recipients. “That is a benefit of giving back early — you get to see your investment in action,” he says. Q: What is one of the most powerful lessons you’ve learned in life? Marc Gall, vice president of BOK Financial in Milwaukee, was a finance and economics major. father and spending time with my family is important to me. My friends are important to me. I also have a passion for traveling internationally. I think we should not sacrifice things that are important to us for career or financial gain. I believe that it is possible to have a work-life balance. If that is important to you, the key is finding an employer that allows for flexibility and encourages a well-balanced approach to life. Q: As a banker you know a lot about financial investments. What other kinds of investments are you glad you’ve made? myself through education. A knowledge base is something that can’t be taken away from you. While formal education can make you more marketable to an employer, informal education like reading or talking to others about topics outside of your career, may help shape your worldview and keep life interesting. I went back for my master’s degree in business part time, nights at Marquette University. Money I could have spent on a vacations or other things, I decided was better spent on graduate school. I also attended graduate school of banking at UW-Madison. Q: How did you develop a philosophy of giving back? In September 2018, Marc Gall received the UWL Rada Distinguished Alumni Award, created by professor emeritus Ron Rada and his wife, Jane. As part of a visit to campus, Gall spoke to students and participated in a panel discussion. scholarships. They continue to give for years and years to come. I’ve also learned that while I have the ability to give back with financial gifts, it is not always about giving money — time and effort can be just as valuable. Each person has unique ways they can give back. Finding causes or organizations that align with your passion can be very rewarding. The Rada Distinguished Alumni Award includes a scholarship/fellowship of $2,000 presented to a current student in a department of the recipient’s choosing. Gall selected Kitt Drewiske, a public health and community health education major, who planned a spring break service group trip to Guatemala to build smoke-free stoves in homes and schools. Gall said he wanted to find a student who was invested in traveling to different regions and making the world a better place. Drewiske fit the bill. Gall established two UWL scholarships Marc Gall created the Salt and Light Award for Excellence in Christian Leadership and worked with the family of Jason Letizia, ’03, a friend and fellow alumnus who died in 2015, to establish the Jason Letizia Learn Strong Scholarship. Read more about her previous journey to Guatemala here. The move came after review of IS curriculum at peer universities, faculty interactions at IS conferences and through consultation with employers who actively recruit and hire CBA students full-time and in internships. To obtain access to the SAP software application and offer UWL faculty the materials and training to teach SAP, the IS Department joined the SAP University Alliance. The global program enables more than 3,500 educational institutions in over 113 countries to integrate the latest SAP technologies into teaching. can use to earn globally-recognized SAP certifications that strengthen their career prospects. Students are also able to qualify for the SAP Student Recognition Award by completing coursework approved through the SAP University Alliance. This award certifies a student’s significant hands-on experience with SAP, thus improving their competitive advantage in the job market. For the first time, a group of UW-La Crosse marketing students are among the top 10 finalists nationally in the American Marketing Association Collegiate Case Competition. As finalists, UWL’s team will present to members of the boards of The Wall Street Journal and the national American Marketing Association during the AMA 41st Annual International Collegiate Conference, April 11-13, in New Orleans, Louisiana. If selected as the winner, UWL’s team would present in front of thousands at the international conference. Since the curriculum revision, the department has received positive feedback from employers and within the IS department, including students who say the course helped prepare them to hit the ground running in internships, says Haried. The SAP application allows students to see how all business areas interact, integrate and work together. They can better understand the big picture of business and how technology supports all areas of business. “The largest benefit so far has been seeing the excitement by students in experiencing how business transactions flow through the SAP application,” says Haried. The finalists in the American Marketing Association Collegiate Case Competition are, from left, Brett Gluth, Nick Janco, Jasmine Bogart-Falbo, Ellen Fallon, Erika Ward, and Bennett Williams. All except Ward, who graduated in December, will present. PAY INTERNS? UWL economics prof: That’s the wrong question to ask It is a common question: “Should an intern be paid?” But this is the wrong question to ask, says UW-La Crosse Economics Professor John Nunley. Nunley and his team used a machine-learning algorithm to analyze ad text to compare the characteristics of internships and actual jobs. They found when an internship is more like a job, firms tend to pay. But when internships are more like educational experiences, firms tend to not pay. An implication of this is that subjecting internships to the minimum wage law would potentially be problematic as it could result in fewer internships, explains Nunley. The researchers also found a strong link between the regular market and the internship market. They found the higher unemployment and minimum wages at a particular location, the less likely an internship was to be paid. Their large study also provided an overall picture of the internship market and access to internships. Among the findings: n Black applicants are about 30 percent less likely to receive a positive response from an internship opening. n Applicants living far away from an internship opportunity are 40-50 percent less likely to receive a positive response from the employer. n Employers seeking paid interns are about 80 percent less likely to call back an applicant than firms seeking unpaid interns. n Part-time internships are less likely to call back applicants, particularly for internships that are paid. A look back: Nunley’s research made national news In 2014, John Nunley also collaborated on research featured in the Wall John Nunley Street Journal, as well as other state and national news outlets, blogs and policy briefs. The research found that a college graduate with internship experience in the same field as the job they were applying for was 14 percent more likely to get an interview than a college graduate who did not. And an internship was more important than grades or major, according to the study. What is the impact of postponed retirements on younger workers’ wage growth? This economics research, co-authored by a UWL associate professor and UWL alumna, was recently mentioned in Forbes. Associate Professor Mary Hamman, UWL alumna Marissa Eckrote and three others co-wrote a paper “Is it Bad to be Green in a Greying Firm?” Read about their study. The study found that after an increase in pensionable age in Germany required older workers to work longer, their younger colleagues were less likely to get large raises — raises over 10 percent. This could happen, for example, if postponed retirements lead to delayed promotions. The project was funded by the Alfred P. Sloan Foundation’s Working Longer Program. Is it Bad to be Green in a Greying Firm? Associate Professor Mary Hamman started at UWL in fall 2013. May 2015 graduate Jane (Qian) Zhang, an accountancy and information systems graduate, is originally from Guilin, China. Zhang is now living Faribault, Minnesota, and is considering ways to grow in her career, using her experience as an international student to help other foreign students successfully adapt to life in the States. 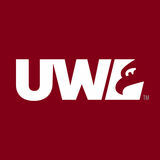 Support future generations Gifts of all sizes work together to support future generations of UWL students. To learn more visit the UWL Foundation website at www.uwlax.edu/foundation, call 877.895.3863 or email foundation@uwlax.edu. Shane Stuhr, ’07, finance, is managing director of Northwestern Mutual’s Onalaska office. Talent Connection Network: Company profile Northwestern Mutual’s manager describes the TCN as ‘a business relationship where everyone wins’ UWL CBA Dean Laura Milner launched the Talent Connection Network in fall 2016. Through this initiative, organizations meet and connect with CBA students and faculty by visiting student clubs, meeting with faculty, speaking to classes and more. The businesses provide financial support of CBA students and faculty development opportunities such as study abroad or participation in national conferences. Six companies have joined the Talent Connection Network. Shane Stuhr, ’07, finance, is managing director of Northwestern Mutual’s Onalaska office, the first company to join. He answers questions about the company and the TCN. Northwestern Mutual’s Onalaska office employs 18 full-time financial advisors, seven who are certified financial planners, 15 full-time administrative associates and five interns. About 47 percent are graduates or current students from UWL. planning. We spend most of our initial meeting learning about what is truly important to people regarding their personal, professional and financial goals. We use that as a foundation to help with cash flow management, debt management, investments, risk management planning, retirement distribution planning and estate planning. Each person’s situation and plan is different. That is what makes it fun. Q: Why do you invest in the CBA through the Talent Connection Network? internships in the U.S. I even completed our internship program back in 2006, prior to transitioning to full time. Q: What is your experience with UWL students you have hired? A: Two characteristics stand out. They are humble and hardworking. Q: How has your relationship grown with UWL since joining the TCN? relationship with UWL and more of a partnership. They seek our input on different topics and we are able to work with UWL to have exposure for everyone’s benefit. It is a great business relationship where everyone wins. Dean Laura Milner has done a lot to make this a more formalized relationship, and I appreciate her proactiveness. CBA student orgs celebrate birthdays Five decades of Delta Sigma Pi, four decades of AMA The College of Business Administration’s student organizations have hit some major anniversary milestones. This year, UWL’s chapter of Delta Sigma Pi, professional business fraternity, turns 50. Other orgs, including the American Marketing Association and Financial Management Association, turn 40. And Beta Gamma Sigma turns 30. Let’s take a look back at the beginning of these groups. 50 years of Delta Sigma Pi In UWL Murphy Library Special Collections, boxes of scrapbooks are filled with memories of Delta Sigma Pi business fraternity. Pages are devoted to photos of Christmas parties, luncheons, career days, company tours, guest speakers and community projects. The fraternity started on campus 50 years ago becoming the first national professional fraternity at Wisconsin State University, La Crosse. Delta Sigma Pi replaced Beta Alpha Epsilon, another fraternity founded on campus in 1967 in response to strong interest from students in forming a business fraternity. In November 1967, the director of Delta Sigma Pi came to La Crosse with hopes of fostering interest in a professional business fraternity, according to clippings in a Delta Sigma Phi scrapbook from 1968-69. He met with Cloyce Campbell, then chairman of the department of business and economics, and students. The next day a notice was posted on the business bulletin board, “All students interested in forming a business fraternity, please sign below.” Within a week, there were over 80 signatures. Fall 2018 photo of Delta Sigma Pi members. A scrapbook photo from 1977 Career Day, sponsored by Delta Sigma Pi. The event gave students an opportunity to talk to firms about job opportunities. Photo courtesy of UWL Murphy Library Special Collections. A look back UWL’s American Marketing Association chapter in the 1980 Racquet Yearbook when it was in its third semester at UWL. During this semester G. Heileman Brewing Company sponsored seven sessions of speakers for AMA focused on different aspects of marketing. First row, from left: Don Goldberg, Mike McGrath, David Grant, Jim Krieger, Kathy Pandl, Jeff Johnson. Second row, from left: Lynn Clemens, Kathy Ready, Bev Brown, Ann Dietrich, Giesla Fuss, Harriet Wishnick, Annette Gelbach, Jill Jachowicz. Row 3: DeEtt Westlind, Tom Carrigan, Don Christenson, Dr. Bill Pollman, Char Ablan, Jane Pedersen, Dan Kosch, James Cruthers. Photo courtesy of UWL Murphy Library Special Collections. Delta Sigma Pi turns 50 this year. Image from the 1985 Racquet Yearbook. Photo courtesy of UWL Murphy Library Special Collections. UWL AMA chapter members attend the regional Whitewater AMA Conference in 2018. Here Beta Gamma Sigma member Jon Barnes participates in the Global Leadership Summit in November 2016. Beta Gamma Sigma is the national scholastic honor society for students of business and management. Election to membership in Beta Gamma Sigma is the highest scholastic honor that a student in an AACSB-accredited school of business or management can achieve. UWL’s chapter started 30 years ago. factors such as affordability, accessibility and reputation, as well as financial benefits available specifically to people with military experience. Interested in earning your MBA online? number of online MBA programs appearing in the rankings has increased by 35 percent. The University of Wisconsin MBA Consortium is a unique and innovative program that provides students with the opportunity to complete their MBA degree totally online by partnering with four AACSB accredited business schools within the University of Wisconsin System. Learn more at www.wisconsinonlinemba.org. Local lawyer, lecturer touches many lives David Russell receives Beta Gamma Sigma’s Distinguished Community Member Award When he isn’t delivering Mobile Meals or volunteering mediation services to Wisconsin farmers, David Russell is sharing his four decades of experience as a lawyer with UWLa Crosse students. Russell, a partner at Hale, Skemp, Hanson, Skemp & Sleik Law Firm, is an adjunct faculty member who has been teaching business law to senior accountancy students since 2001. Russell received the Beta Gamma Sigma (BGS) Distinguished Community Member Award at the annual BGS Induction Ceremony in spring 2018. Beta Gamma Sigma honors community members whom they deem embody honor, wisdom, earnestness and who have had direct student involvement at UWL. After earning his business and law degrees from UW-Madison, Russell joined Hale, Skemp, Hanson, Skemp & Sleik Law Firm where he has worked since 1979. The Beta Gamma Sigma award is not the first time he has been honored as for his contributions to his community or profession Here are some highlights from his distinguished career: n Past president of the La Crosse County Bar Association. n Recognized by the State Bar of Wisconsin for outstanding contributions of legal services to the poor in 1993.
n Received the State Bar Leonard Loeb Award in 2016 for an older attorney who has made significant contributions to the legal community and demonstrated a love for the law. n Started a monthly free legal clinic in 2006 that he still manages today. Russell recruits volunteer attorneys and paralegals who answer legal questions from members of the public during the monthly sessions. n Served as an officer on the Board of Directors of the Boys and Girls Clubs of Greater La Crosse since 1997.
n Received the Jefferson Award, a national award for community service, in 2012. n Helps deliver Mobile Meals, and serves Monday’s Meal. n Helped provide the first location for the La Crosse Winter Warming Center for homeless people. n Past president of the the U.S. Curling Association and the Wisconsin State Curling Association. n Served more than 30 years as a state volunteer mediator for farmers and their creditors. n Serves on the Board of Directors of Legal Action of Wisconsin, a state-wide law firm providing free civil legal services to low income people. n Past president of the La Crosse Public Education Foundation. n Served on the Board of Directors of the La Crosse County Historical Society. n Recognized as a Wisconsin “Super Lawyer” since 2011. Lawyer David Russell with CBA Dean Laura Milner as he is presented the Distinguished Community Member Award. Russell has maintained a long-term commitment to teaching because of his passion for the rule of law in a free market economy and the positive feedback he gets from students. The UWL College of Business Administration Citizens State Bank First Friday Lecture Series continues with a presentation from Alumnus Tom Wargolet, ’85, executive vice president and chief operating officer of the Lifetouch Schools Division. The free public lecture will be at 3:30 p.m. Friday, April 5, in Skogen Auditorium, 1400 Centennial Hall, 308 N. 16th St., La Crosse. A reception will follow the lecture in Cameron Hall of Nations, Centennial Hall. The lecture series provides scholarly dialogue about business management and leadership directly from today’s business leaders. As executive vice president and chief operating officer of the Lifetouch Schools Division, Wargolet is responsible for all operational aspects of the schools’ business including sales, field execution, marketing, fulfillment and customer service. He joined Lifetouch in 2005, holding finance and other administrative titles until being named to his current role in 2017. Wargolet is a 1985 UWL graduate with a bachelor’s degree in accountancy. Alumnus Bryan R. Johnson, ’86, presented “From UWL, around the world and back: A journey created through corporate finance” in February as part of the UWL College of Business Administration Citizens State Bank First Friday Lecture Series.